Discount Magic - ESP Deck - Bicycle. 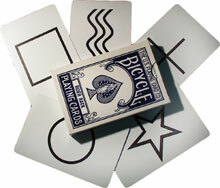 Each set of symbol cards prominently silk screened. Each symbol is repeated five times, making a deck of 25 cards.